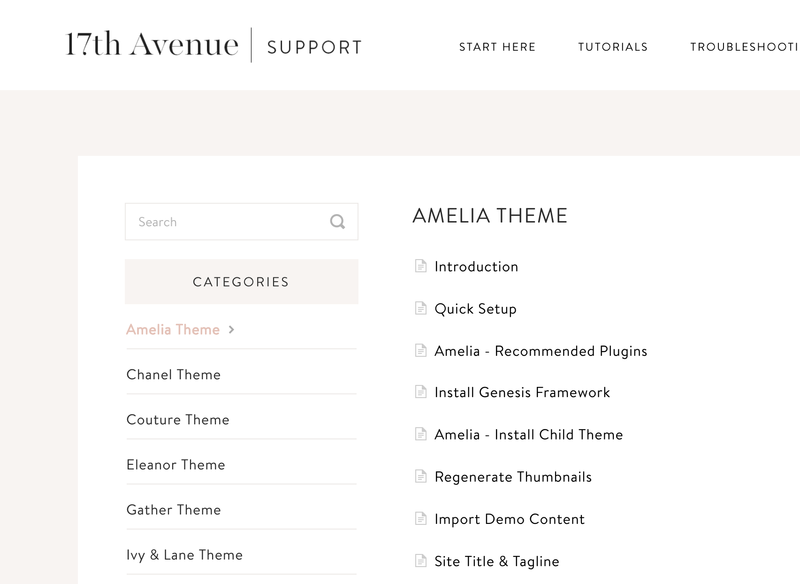 17th Avenue is so thrilled to introduce a new support experience for our WordPress themes. We've been designing websites/themes & providing support for over 8 years and have gained so much insight along the way. We really tried to create a space that meets YOUR needs as a blogger/business-owner/superwoman, whether you are a novice or seasoned pro. Take a look around the site or continue reading for a detailed breakdown of all the features you'll find here! "Theme Documentation" is a term for all of the necessary information, instructions, etc. that you'll need to set up your theme. Each of our Premium WordPress Themes has its own Theme Documentation section filled with articles that will walk you through how to set up your theme. To begin installing your theme, click on the first article and work your way down. You don't have to do everything in order, but you should always install Plugins, Genesis, and the child theme before moving onto the other areas. Most Common Issues - Pretty self explanatory, these are the issues that we are asked about most. Quick Fixes - Easy fixes you can do on your own if something isn't quite right on your site. Something is Missing - This category contains solutions if there is something missing from your site, such as page content or images. Doesn't Look like the Demo - This category covers what to do if a part of your theme is not displaying as it should. Theme Tutorials - General tutorials related to your 17th Avenue theme. WordPress Tutorials - Tutorials on how to use WordPress, including setting up navigation menus, using categories & tags, and so much more. Plugin Tutorials - Tutorials related to using and configuring plugins. There are a lot of tutorials and documentation on this site – over 400 articles! So if you ever have trouble finding what you're looking for, just click the 17th Avenue logo at the top left. That will take you to the front page where you can type your question into the search box. Even if you don't know the correct term for what you need, the search box will make its very best guess and try to get you to the right place. If you've gone through the Theme Documentation, Troubleshooting, and Tutorials, and you're still having trouble, our support team is more than happy to help! You can submit a support ticket right here.